The text of Ronald Reagan's First Inaugural Address of Jan 20, 1981 attests that his was the first inaugural ceremony to be held on the West Front of the Capitol Building; thus Mr. Reagan was facing the Washington Monument and the Jefferson and Lincoln Memorials, as he notes in his address. And yes, I believe that he was standing on their and others' "shoulders" as he said, but he was also looking into the distance while mentioning the Potomac River and Arlington National Cemetery with its simple crosses and Stars of David. Here is an example of a man speaking publicly in two realms at once (maybe more.) His 'code words' warmed the hearts of the religious folk who did so much to elect him and were so totally charmed and thrilled with him as president, yet Illuminati references are sprinkled throughout the speeches of his administration. As I continue studying this chart and the Reagan years, I expect more of such references to become clear now that the NWO has its ugly head stuck out for all to see. Finding that more and more people (finally) see the trajectory of this one-world-government swill (which began way before Reagan's presidency) makes freebie blogging less of a time-waster in my book of working on behalf of the collective. Well, Justice Warren Burger presided that 1981 day at noon, and five minutes after not being president anymore - which means 12:05 pm est - a secret service agent whispered in former President Carter's ear that the US hostages in Tehran had been released. This dirty-tricks episode finagled by the GOP and CIA to undermine the Democrats is perhaps one of the more visible examples of political cynicism and lowness ever recorded. The CIA longed to cover up their previous meddlings and mayhems, of course, and the Rs were intent upon the presidency - a majority was gained for them in the Senate in 1980. And they desperately wanted to cover up their collusion with the CIA and certain Iranian officials in Tehran. The American people's concerns factored in not at all - and being honest with the people? Fugeddabowdit. Below you see an image of the horoscope of the 1st Inauguration of Ronald Reagan with notations added, click to enlarge. Outside the chart and highlighted in green are Mr. Reagan's natal placements; a few US natal placements are added as well. (Ex: US natal Mercury Rx at Ic, as it is now but the Ic is a degree later these days. This places US natal Pluto at Midheaven, the Goal Point of any chart. As you see, RR's inauguration in 1981 was a Mars-to-natal-Sun transit for the Gipper, among other things. His 'coronation' occurred during a Saturn (control; authority) Hour; the rising degree at noon of Jan 20 was a smidge earlier back then, thanks to precession, so it's at 13Tau47, conjunct Chiron 13:24 Rx ('crisis in values'); natal Moon and n North Node (NN) are rising indicating the successful candidate's fame, prominence, and popularity with the public bwo Hollywood, the Screen Actors' Guild, and the governorship of California. His 'good fortune' at being selected is indicated by NN - and Moon - in 1st house. (And of course, 'guilds' conjure the image of Freemason lodges which began, unless I am mistaken, as guilds.) The Part of Brethren is rising, too, and I couldn't resist adding that little 'secret society' nugget for you. 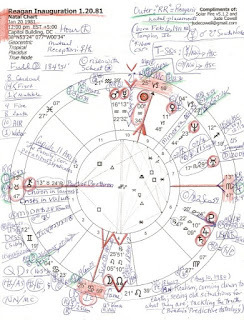 Natal Moon/NN rising puts his natal Jupiter/SN on the Descendant, of course, and I've covered a good bit of that in my June 30 post about Reagan's Jupiter Return as he signed the Garn-St Germain Act and opened the deregulation door back in 1982. This is my "I knew it was You, Reagan" article. Mars-to-n-Sun gives a surge of vitality (although RR's future health problems may be foreshadowed by Chiron conj ASC); enthusiastic endorsements come easily with this transit, courage shows and one demonstrates one's integrity and principles. Competitive situations come along and one is up for them - this would be in effect for the duration of his presidency, or at least for his first term, if you prefer. The Iranian hostage crisis may also be indicated by Chiron Rx conj ASC. Well, gold-hoarding Midas surely was rising back in 1981, and we know that the Decade of Greed - the 1980s - helped set the stage for our current circumstances. Guess Reagan really did stand on the shoulders of giants, didn't he? All US presidents do, as the baton is passed and our much-touted 'Manifest Destiny' is further promoted. America's Great Seal has been turned over with Mr. Obama's selection (aka, 'election'), with its reverse now representing this nation...the all-seeing eye of Horus as the capstone upon the pyramid of power. You may read my post on the Reaganomics Eclipse of 1981, if you wish. Current transits are not entered on the Inaugural chart below, but it's interesting to note that transformative, destructuring Pluto conjoined 1981's Neptune 23Sag44 in 8th house off and on in 2005, crossed RR's natal ASC 27Sag16 in 2007 (Pluto has been in orb of these positions for the last few years actually), and the Dragon now pauses upon 1981's Minerva 00Cap35...and will conjunct and hang about with RR's natal Mars 3Sag59 beginning before the end of 2010. Pluto-to-Mars: pursued interests from the past gain deeper determination; focus sharpens; greater control and power are sought. Ronald Reagan's First Inauguration Jan 20, 1981, noon est, Capitol Building, Washington, DC; Full Moon 184 degr 51 mins; Saturn Hour; from historic record. thanks for all the work. Astrologers are talking about 2012 but I will always believe that the game was over when this country elected that mean old man. I "knew" this so deeply that I started weeping watching his nomination, weeping as if there had been a death in the family. Hey! is this a joke? Under "visual verification I am told to listen and type the numbers you hear!!!?? ?